When I told my partner, Mandy, I wanted to sign up for the 40th Paris to Versailles run for my 40th birthday she thought I was insane. Could I not just take a regular holiday like every other person? She realised as the words came out, the answer was NO. I’m not a fitness guru or an elite athlete; I class myself as a regular Joe who likes to exercise and enjoys fitness holidays. Many years ago I made changes in my life that not only have helped me lose weight and gain more energy but challenge my limitations. I participated in events like HBF Run for a Reason, Rome Marathon, Tough Mudder, True Grit and Spartan Race. I used these as fitness training goals to work toward and to have a little fun with. 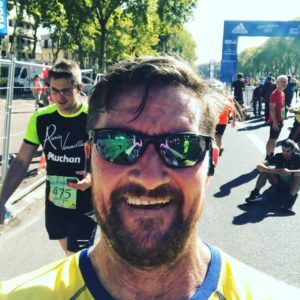 Back in 2015 when I was getting ready to tackle the Rome Marathon, I missed out on running the Paris Half Marathon. It was a real shame, as it would have been a perfect training run. So as you can imagine I was keen as mustard to get this run under my belt. 2017 started out with the notion of going to Paris for my 40th birthday. I love France and I do try to get there every couple of years, however, my 2017 visit was going to be different. I started to look around to see what events were being held during late September. (Although my birthday was at the start of September we decided to go later in the month because we were taking our daughter Mikayla.) 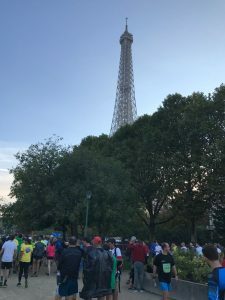 I searched the web high and low and came across the Paris to Versailles run, luckily for me it aligned perfectly with our arrival the day before. What is the Paris to Versailles Run? The Paris to Versailles or sometime called “Paris–Versailles La Grande Classique” run is the Australian equivalent to City to Surf, minus the surf. This international race is a must for fans of middle-distance races. Every year some 25,000 competitors take part in this classic running event. Starting at the iconic Eiffel Tower, the route takes you through the neighbouring areas of Issy Les Moulineaux, and Meudon and its famous “difficult stretch” the Côte des Gardes, Chaville, Vélizy, Viroflay and finishes at Versailles, on avenue de Paris, opposite the Palace. The course length is 16km with slightly varied terrain but mostly on bitumen with breathtaking scenery. During 2017 I hadn’t actually run a great deal, so I had to approach training for this event like I was a beginner. RunKeeper has some great training plans to utilise. This App has 5km, 10km, Half Marathon & Marathon running plans. I had 6 months to train for this event, so I started off by doing a 5km plan just to restart my body. For anyone who hasn’t done enough exercise or activity, I found this plan was ideal for my immediate needs, however, I didn’t rush the plan. I completed all the training at my own pace instead of over the set period of weeks that was listed on the App. The training plans from RunKeeper range from 7-12 weeks, however the 5km and 10km plans only cover 7-8 weeks. 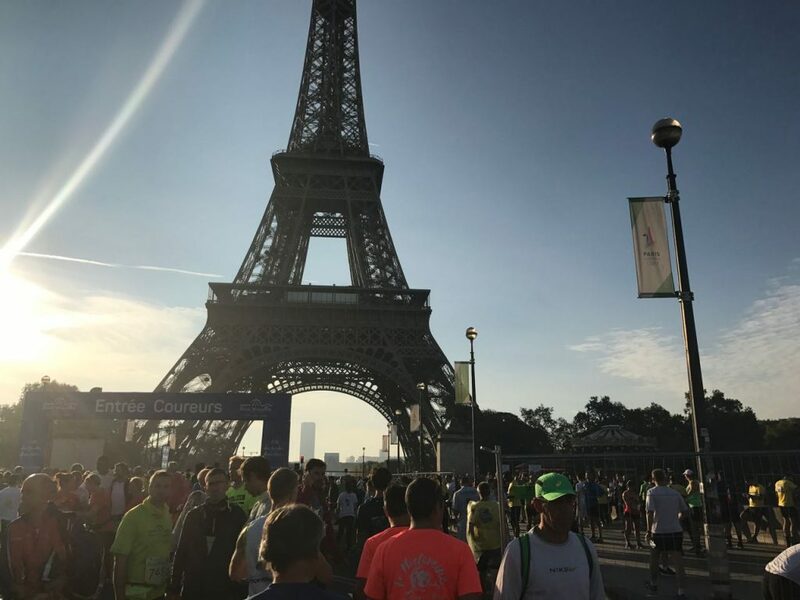 If you find yourself tackling something like the Paris to Versailles run for your first event, there are some training tips to keep in mind. Warm Up – Make sure you adequately warm your body up. Check out our warm up do’s and don’t’s. Water – it is important you replace any fluid that you lose. Keep this in mind during the hotter months, have a good 500ml 15-30 minutes prior to running. Find out more facts about hydration. Cool Down and Stretching – once you finish your run, make sure you walk around for at least 5 minutes. This will allow the muscles to cool down a little rather than coming to a complete halt. It is then important to stretch glutes, quads and especially calves. If you have the opportunity use a bottle to roll over your muscles when you get home. Electrolytes – Now for the smaller 5km runs this may seem like an overkill. However just like replacing fluids we must also replace salts and minerals the body has lost through sweat. A good electrolyte will help with this and reduce any chances of muscle cramping. The Paris to Versailles event is held is in late September during their autumn; so I wasn’t surprised to see many runners wearing a light rain jacket or plastic cover until the race began. But it turned out to be a beautiful day and comfortably warm. I got there early enough to take in the atmosphere of what the day had to offer. 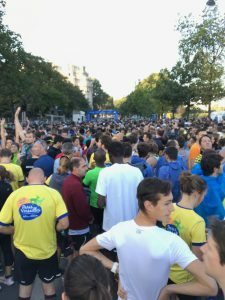 Access to the starting area and surrounding the Eiffel Tower was cut off for the race and the 25,000 runners waiting eagerly for the start was a sight to behold. There were athletes from all over the world, the majority coming from all over Europe with a handful of hopefuls like myself from the other corners of the globe. I really started get pumped up as I walked around taking it all in, especially with the beats being dropped by the DJ. There was plenty of space for those eager beavers to warm up, run back and forth plus stretch. I have to admit I was a little taken back when I witnessed a bunch of male runners all using the bushes as their personal cubical though, but no one seemed to really care. Relief swept over me as I passed all the urinating people to see the porta-loo off in the distance. I got to keep my dignity. Like any well organised event a bag drop off point was situated on Pont d’Iéna, the bridge directly in front of the Eiffel Tower. Admittedly i was a little disoriented trying to figure out where to drop my bag to ensure I would receive it back at the other end with no drama. However, in the end, it really didn’t matter where I dropped it off, I got my ticket to claim and I was ready to rock. People have asked me if I get bored running… NO! There is only one thing that makes running events boring, and that is waiting for them to start. It can be a real problem, especially if you are going it solo. However if you are lucky and happen to be a fairly happy-go lucky person you can always just chat with the runner next to you. Unfortunately for me it was hard to find anybody who spoke English. I was stuck in a sea of Frenchies waiting for the starter to kick things off. After placing myself near the left side of the chute, about half way down, disaster struck. I needed to go to the toilet and not a single porta-loo in sight. What to do? Do I loose my place and drain my body, or grin and bare it and hope the flood gates remain closed? I made the decision to hold on for dear life until I could find the first available toilet stop. On top of the hour long wait to go until the start of the race, there were waves of runners being released every 5 minutes so I probably had enough time to go and be back in position with time to spare. But when you get a good spot, the last thing you want to do is abandon it. Anticipation was building just like the water in my bladder, but everyone was psyched and ready to run. As I witnessed wave after wave of runners take their mark I couldn’t help but feel super pumped. The culmination of months of training and waiting was over. It was time to nut up or shut to quote “Zombieland”. The people of Paris were out in droves to support the runners. With many of the spectators holding up signs and cheering on friends and family. It was great whilst running along because I was able to practice reading French. Most of it made sense or I at least got the message. The run alongside the River Siene was great until we started to run on what I would class as the freeway. There was no traffic however that stretch of road isn’t terribly exciting. The tunnel, on the other hand, had a wonderful cooling effect and gave me some relief. There were water stations at roughly 5km, 9km & 12km. Plus in some instances they provided runners some sugar and bananas to eat whilst running. If you need that little extra energy before coming to a refreshment station, you might want to try some energy gels. Energy gels are small sachets of liquid that provide a sugar hit to keep your body fuelled. Some of these gel packs contain caffeine if you want an additional kick. As I reached the other side of the tunnel I saw the thing I had most dreaded. It was a hill to end all hills! I remember looking at the diagram provided and calmly thinking that may be a little tough… How wrong I was. It was perhaps the longest and biggest hill I had ever attempted. This mammoth hill was approximately 3km long with an 9% gradient to give a total of 135m climb! It will be forever known to me as the equalizer! Once I had tamed the beast of that hill I was lucky enough to find myself at the edge running into Forêt Domaniale de Meudon. With such scenery that you don’t normally get to see when you are in Paris. It really was a site and a relief as it provided some small downhill sections and flats to regain my composure. Once past the forest I was able to view some quaint little cottages that rest on the outskirts of the forest just before we all hit the last leg. The home stretch was caked with spectators, photographers and other media people capturing it all. As I went past the photographers I have to admit I puffed my chest out proudly and propped myself up taller than I was feeling at the time. When I crossed the finish line I was met by one of the medal givers and a tunnel of giveaways. After completion, I composed myself, took a selfie and patted myself on the back. I had hopes of completing the race in 1hr 30min, but I fell just outside of this time by 1 minute & 41 seconds. Still a good effort even if I do say so myself. I looked around at all the chaos of the event and was glad my partner and I decided it would be best to meet at the palace after the race. The finish line was bombarded people celebrating with family and friends. My girls would have gotten a bit confused in all the kerfuffle and may have gotten lost. Flags from all over Europe were being waved in the air like a calling card for the runners to levitate towards their countries flag, but I couldn’t find Australia. Look, to be fair, a running event isn’t for everybody. However if you want to do something a little out there and see some great sights that you wouldn’t normally see. I can’t stress enough why you should join in the Paris to Versailles run. I saw people in wheelchairs, pushing prams and even a disable guy on crutches getting into the spirit. So ask yourself, do you want a normal holiday or a holiday with a great memory?